The chocolate sauce can be prepared at home.U can buy ur fav Ice-cream and start doing this desert. Preparing the chocolate sauce: Dissolve sugar in water.Heat the sugar dissolved water,chocolate flakes or cocoa powder and stir for 3 mins.Add butter and maida flour and mix well.Stir continuously for 12 mins till it comes in thick consistency like chocolate sauce. Preparing the caramelized Sugar: Heat the caramelized sugar(sugar dissolved water-boiled for 10 mins) and add vanilla essence and mix well for 2 mins. Heat Butter in a sauce pan and saute the banana pieces till light brown in colour for 5 mins. Add caramelized sugar and mix well for 2 mins.Turn off the flame and add honey and mix the sauted-banana pieces well. Serving: Take 6 large ice-cream cup, place the caramelized banana first then put 1 scoop Butterscotch Ice-cream, then put 1 tbsp caramelized banana and then place 2 scoops ice-creams over it.Add the chocolate sauce around the edges and few crushed cashews and crushed pistachios on top and serve this chilled. Thank u Mrs.Hariprasad,I lov ur recipes too. Hi Christy...how r u? This is one awesome receipe. It came out so well that next week I'm making this again for my sister's b'day party. Thanks for such a good receipe. Can you give me a recipe of Ice cream from scratches.Thanks. 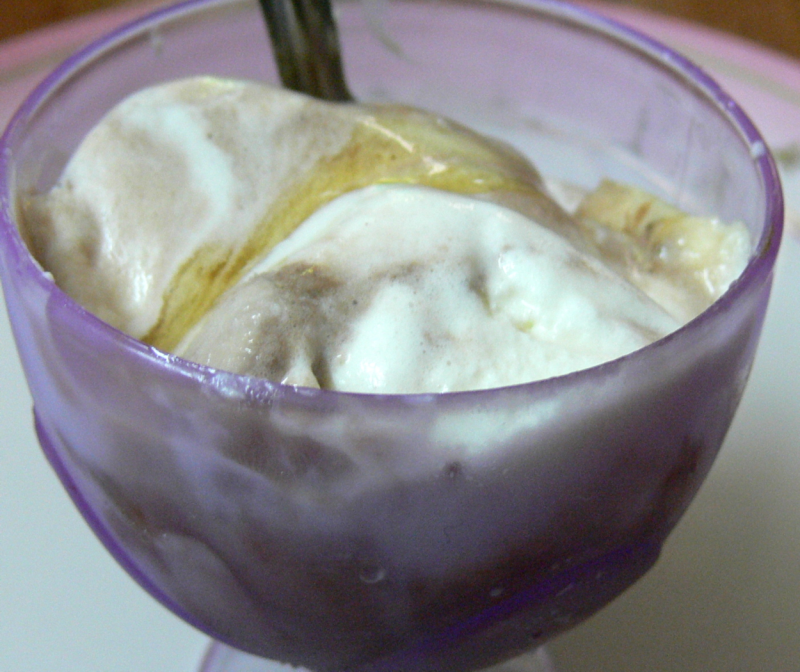 Hi Rajeswari, thank u so much.The juicy banana pieces taken with chocolate syrup in Icecream gives a sweet kick.